Fans have anxiously been waiting for new music to come from the Denver-based electro pop outfit known as Breathe Carolina. Not because it’s been such a long time since the band last released music (Hell Is What You Make It was released in 2011), but because longtime vocalist/co-songwriter Kyle Even recently parted ways with the group. Kyle is a founding member of the band, and with the release of Savages imminent, fans are wondering if he’s actually on the new album or not. If not, how different will the music sound? The band has changed the sound of their music over the years, and in doing so they’ve moved more toward electronic dance music with each release. They’ve managed to keep a strong focus on the vocals and lyrics throughout, which is a reason why I’ve stayed a fan of their music. Kyle did the unclean vocals, so it’ll be interesting to see if that element will still be included in any of the new songs. 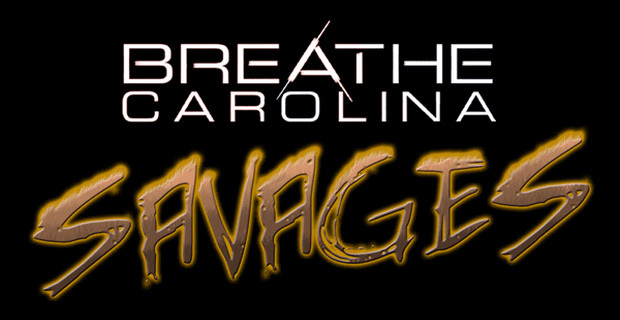 Earlier this week, Breathe Carolina finally premiered the first single off Savages, which also serves as the title track. The song starts off with some synth, and transitions into David Schmitt singing. The music builds up to the main chorus, and just when you think you know what’s next, the song kicks into gear and dives into a heavy dance-influenced sound. This sequence is repeated a few times until the song is nearly over. The chorus itself is relatively short and is repeated throughout the song. The lyrics are simple, and the music is simple. No unclean vocals, nothing too technical, and it even sounds like they all but dropped the electric guitar from the lineup. This song has a catchy, repetitive chorus, and some heavy bass that will make you want to dance. Is the song super creative though? I don’t think so. While they have always leaned toward dance music, this is almost entirely dance/dubstep influenced. One of the things that made Breathe Carolina so enjoyable was the fact that they managed to focus on the lyrics in their songs, and it’s sounding like they might have lost that. Don’t get me wrong, it’s definitely fun and I certainly look forward to hearing what else they have in store for us, but I do not feel this is the best song they have put out in recent years. It’s also impossible to tell if Kyle has a part in the song or not. Yes, there’s no unclean vocals, but does that mean he had no hand in the recording at all? We might have to wait just a little bit longer to find that information out. I for one hope they have a little bit more up their sleeves than just more dance songs.